The Washington region was hit with another blast of snowfall on Saturday. Though the forecast early in the week appeared to show the storm staying well to the south of the area, by Thursday night and Friday it was becoming more apparent that an accumulating snow event was about to occur. When I got to work at 4 a.m. Saturday morning, I went over all the forecast data and decided to keep the current forecast of 3" to 6" (on average) in the Metro area. The National Weather Service took in almost 200 official measurement reports from trained spotters scattered from Charlottesville to Aberdeen, Martinsburg to Saint Mary's. Of the approximately 155 reports in the NBC4 viewing area, 119 (about 75%) of them fell in the 3" to 6" range. 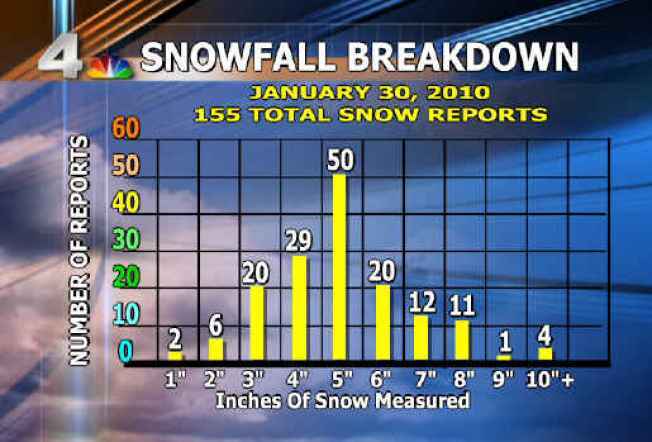 Take a look at the breakdown and you can see why forecasting "exact" storm totals in advance is always a tough task.